Dont you just love Lipton Tea. What I like even more is Sun Tea. I am not sure why but it just taste better. I try to make a couple of pictures every day. As you know I accepted a position with PlayItOnTheWeb.com. I will be working part-time. I am going to be making banners like the one below. That is only the first one done very quickly. I need to improve it. Actually, I need to learn how to make the real ones using a Flash program. Work last night was smooth. Not much was going on. Inventory is finally over. Wow what a crazy time that was. You sound very happy and relaxed. So are you going to do both jobs for a while - - - or just the one from home? 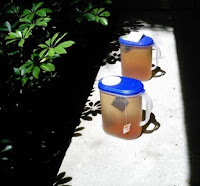 I am not a tea drinker but my husband likes Lipton, too. Miss Lynda, Yeah I am going to do both jobs for awhile. What? You've accepted a job with "Play it on the Web"? No kidding! How cool is that?! Congratulations!